This poem is spillover from the September 18, 2018 Poetry Fishbowl. It was inspired by prompts from erulisse, siliconshaman, and ng_moonmoth. It also fills the "safety" square in my 9-30-18 card for the Fall Bingo fest. This poem has been sponsored by ng_moonmoth. It belongs to the Big One thread of the Polychrome Heroics series. his computer shrilled an alarm. running all up and down the coast. 4 PM on the West Coast. the first waves could arrive. the site of an emergency. with little red crosses on it. they tried to investigate the reactors. that he would need on the trip. and ready to take off. There wasn't much of it left. parts of Canada and Mexico. off the beach into the ocean. America, the sun was rising. that didn't need a perfect runway. the crates of firefly robots. "We don't need to move these. your firefighters to follow them." moved the empties out of the way. a transport hub, and a hospital. to detect chemical or nuclear spills. grasp, lift, carry, or drag things. with huge eyes holding many cameras. so they shouldn't frighten anyone. instead of panicking over them. pointing to the robot dogs. "Some of them, yes," Akio said. chemicals can cause trouble too. that washed clean off the beach?" a volunteer asked with a frown. "Some of them had hospitals." the prototypes of robot crabs,"
Akio said, rubbing his hands. that would need cleanup later. to whatever they needed at the time. their progress through the debris. pointing to a crate of the robears. "Those are nursebots," Akio said. monitor health, and dispense some medicines. The prototypes can do more complex care." "Where do you want us to put them?" the human workers a break." this landing strip is right there,"
close to the resupply source." that the site was suitable. to navigate much of the area. to help unload the robears. the air damp and chilly. Akio shivered in his uniform. "You look cold," a volunteer said. along with instant ramen and soup." "Hot tea and ramen, please,"
hours ago before he took a nap. even instant ramen was delicious. something warm and soft on his shoulders. Akio looked down and saw a red cross blanket. Kanemaru Akio -- He has fair skin, black eyes, and straight black hair buzzed short. He speaks English, Japanese, Korean, and Mandarin Chinese. Akio grew up in Ōkuma, Fukushima, Japan. On Friday, March 11, 2011, his parents died in an earthquake and the town was soon evacuated due to the nuclear disaster. After that, he moved to live with his grandparents in Tokyo, and he became fascinated by the role of robots in rescue and salvage work, especially the ones sent by American corporations. Akio attended the University to Tokyo to study robotics, then took a job at the Kobayashi corporation. He has become a talented designer of robots, adept at both hardware and software. His logical thinking and meticulous approach work best in the laboratory, but his quick hands make him valuable in the field. He enjoys field-testing new prototypes and doesn't hesitate to take risky assignments. As soon as news of the Cascadia Cataclysm reached Japan, Akio volunteered to accompany a shipment of emergency robots to America. Ōkuma in the Fukushima Prefecture of Japan was evacuated after the Fukushima Daiichi nuclear disaster. Kawaii is a particularly flavor of cute in Japan. Making robots adorable reduces the risk of them scaring people. The earthquake strikes Seattle, Washington at 3:58 PM on Saturday, May 28, 2016. The corresponding time in Tokyo, Japan is 7:58 on Sunday, May 29. Shortly after 8 AM, seismic sensors in Japan pick up the traveling waves and people notice that communication access to most of the West Coast of America is going down. Seismic authorities issue a tsunami warning and begin evacuating the inundation zone. Kobayashi scrambles an immediate response of emergency robots. In Portland, sunrise on May 29 is at 5:26 AM. The weather was overcast and 57ºF around sunrise. At 3:58:20, Portland has a 9.0 earthquake with intensity XI. The shaking lasts 4 minutes 50 seconds. 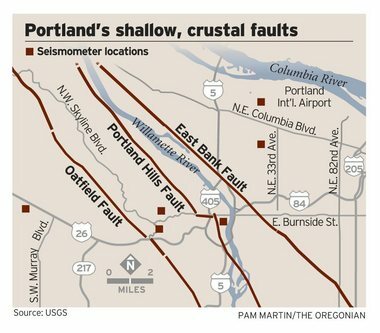 Read about Portland's earthquake risks and see a fault map. The tsunami from the Cascadia Cataclysm will reach Taiji about 10 hours later, based on records of past events such as the May 16, 1968 earthquake in Honshu, Japan. Rajio Taiso is a morning exercise routine popular in Japan. Read about the Hercules aircraft. It's a military cargo plane capable of landing so long as it has a vaguely flat surface. 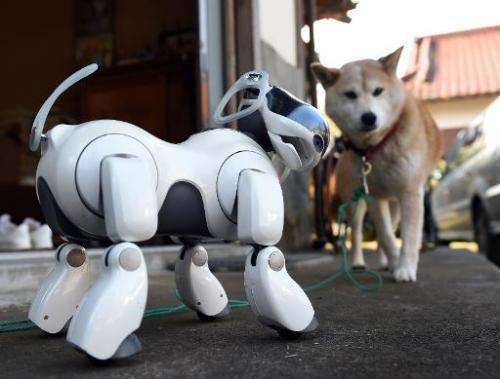 Kobayashi robot dogs are equipped with audiovisual and chemical sensors along with high-power communication gear. Different ones are programmed to track down human survivors or industrial spills. 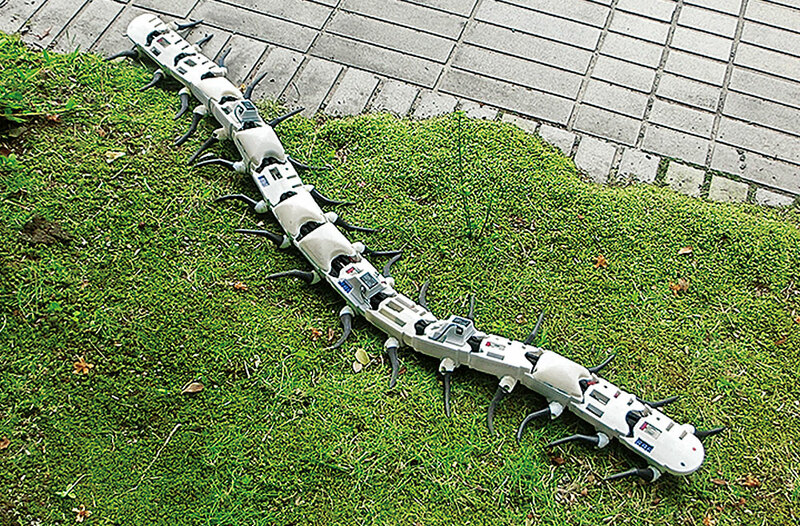 Cyberpedes and snakebots are long skinny robots with ultra-stable locomotion in tight spaces. Unfortunately they look scary to many people. Fear of snakes and arthropods is an innate instinct designed to protect against venomous creatures, which spills over onto other things that look similar. Antbots have many uses, and like natural ants, sometimes specialize in a particular job. They can crawl, climb, cut, dig, search, grasp, lift, carry, or drag things. They also have some ability to link with each other like natural ants to form larger structures. The more realistic versions can be scary. This type of antbot is designed for human interaction and has dozens of tiny cameras embedded in its head to create highly detailed, three-dimensional images. 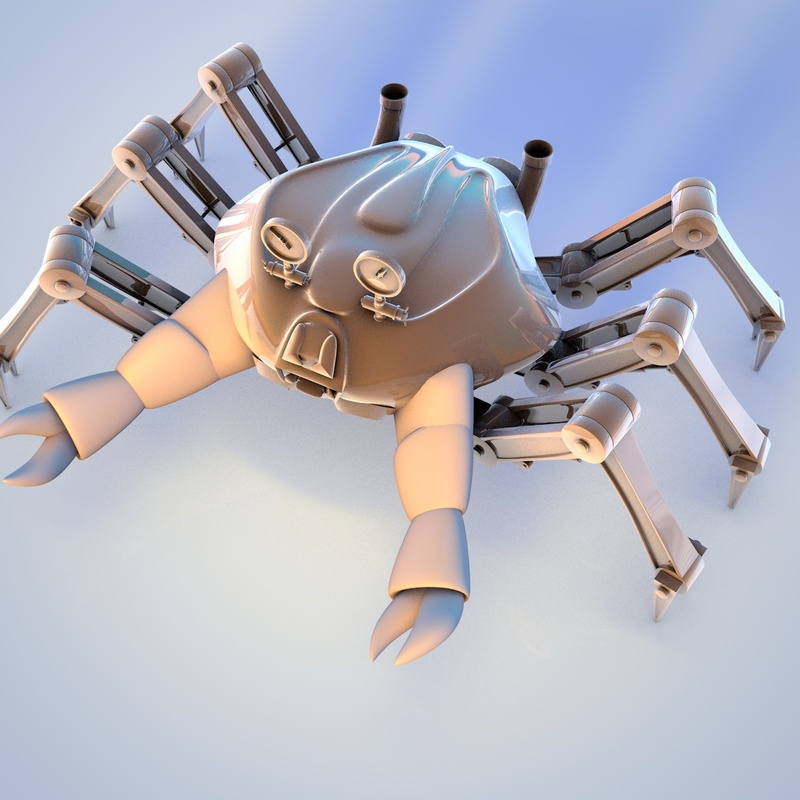 Modular robots are released in large swarms consisting of many different units. These include brain, battery, solar panel, cell, wheel, gripper, communication, camera, touchscreen, and spotlight modules. Sensors include distance, brightness, temperature, radiation, and chemical; these are usually connected to a threshold module to determine actionable circumstances. They can travel outdoors over variable terrain. 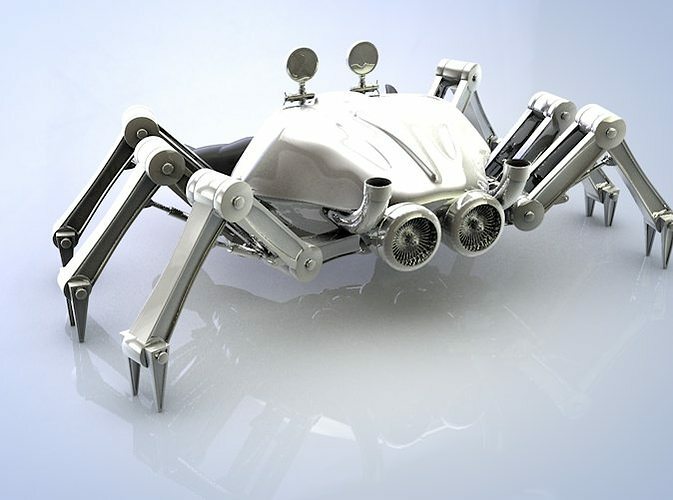 See the front and back of the robot crab. They can swim, crawl, grab, and measure things. They're designed for harsh underwater exploration. They'll probably crash anyway, but they'll last longer than the American ones did at Fukushima. Robot fireflies are released in large swarms to fly over an area. When they detect a dangerously high heat signature, they circle over the area and light up. This attracts more firefly robots and alerts human observers to a hotspot that could start an actual fire. Half or more of the damage from earthquakes actually comes from fires as a secondary disaster. So these fireflies probably have the best bang-for-buck of any rescue equipment. 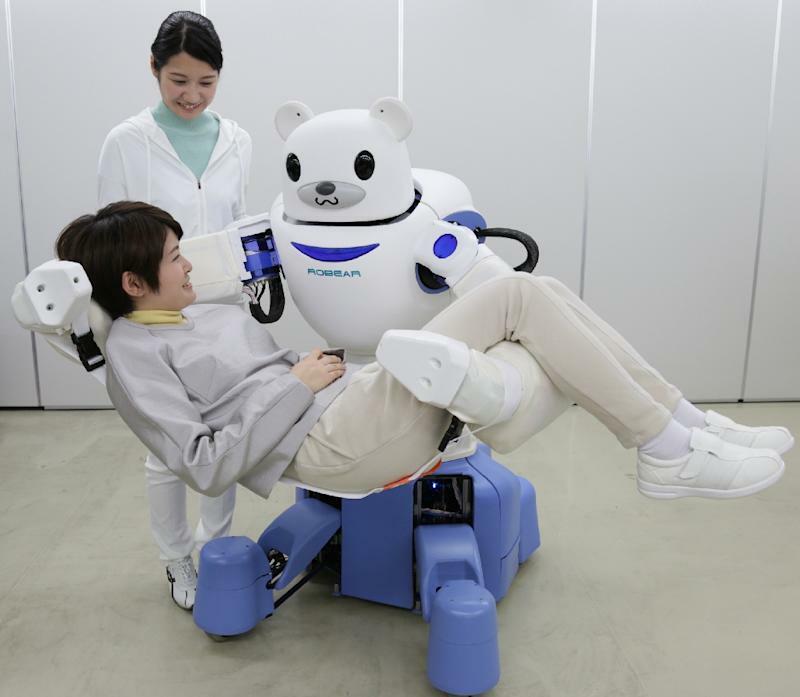 Nursebots such as the robear are deployed to disaster sites because they don't need rest breaks and don't have emotional breakdowns. Standard models are used for lifting, transferring, and transporting patients along with health monitoring, dispensing simple medications, and communication. The prototype models are testing more complex types of health care. Ramen is a popular comfort food in Japan, gaining popularity in America too. Even instant raman can be good, although the best is homemade with fresh noodles. Cup-o-soup has similar effects, and you can make your own instant dry soup mixes. 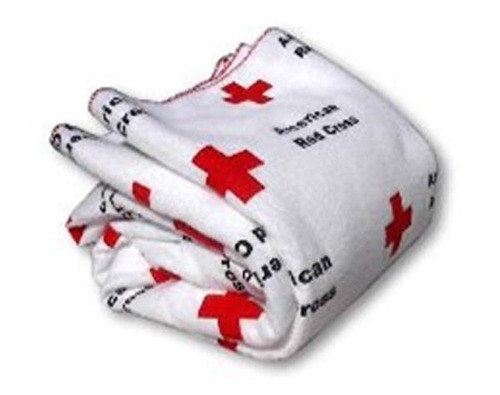 The Red Cross distributes blankets at disaster sites. The last line brought the tears.